ANNAPOLIS, USA (IDN) - A gathering theme in world affairs is the desirability of a treaty [convention] to ban nuclear weapons. Such a treaty would bring the following benefits to all states and people: freedom from nuclear war or nuclear attack, freedom from possible “false-alarm” nuclear missile launch, and freedom from possible acquisition by terrorists of a nuclear weapon from a state’s arsenal. The extant (1968) nuclear Non-Proliferation Treaty (NPT) is not the vehicle for such a ban, in part because the NPT does not prohibit nuclear weapons to NPT states-parties that tested a nuclear weapon (or “explosive device”) before January 1, 1967. Those states are, in order of their first test explosion, the USA, Russia, Britain, France, and China. Three states – Israel, India, Pakistan – have never signed the NPT, and North Korea dropped out in 2003. A premise of this article is that all countries would have to join a new, worldwide nuclear ban treaty before its entry into force. It is here proposed that states, before signing a nuclear ban treaty (often called a Nuclear Weapons Convention), be required by its terms to be full parties to the current chem-bio weapons bans – the 1993 Chemical Weapons Convention (CWC) and the 1972 Biological Weapons Convention (BWC). At present, only five to eight states are generally deemed as probable possessors of chemical and/or biological arsenals, with this excluding CWC parties (USA, Russia, Libya) that are still liquidating their chemical stocks. Envisioning, then, a world on the cusp of banning nuclear weapons, such a world almost certainly would also be geared to renunciation of much-reviled chemical and biological weapons. If, instead, formal renunciation of chem-bio weapons is not a requirement for states before signing a nuclear ban treaty, then one can easily imagine voices in the USA (for example) saying: “Hold on. We formally renounced chem-bio weapons years ago, and now we’re being asked to eliminate our nuclear weapons while some states are still refusing to join the CWC, BWC, or both. We will not renounce nuclear weapons [along with all other states] if any states fail to also renounce abhorrent chem-bio weapons by joining the CWC and BWC… What are those states hiding?” This mode of thinking likely would “carry the day” in some of today’s nuclear weapon states – even though nuclear weapons are more widely, reliably, and variously (blast, heat, radiation, firestorm) destructive and lethal than chemical or biological. The Chemical Weapons Convention does have groundbreaking inspection/verification elements, many of which would be adapted and utilized in a worldwide nuclear ban. 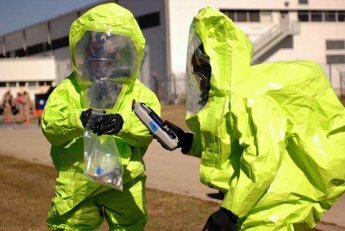 The Biological Weapons Convention, however, has no verification system; and even if BWC verification is adopted in the future, it is widely predicted to be less effective than nuclear and even chemical inspection. But, assuming that in the future there is still no BWC inspection, the unanimity of states’ accession to the CWC and BWC (before nuclear ban entry into force) would lend the chem-bio prohibitions unprecedented geopolitical force. It would also likely reduce, although not eliminate, the potential terrorist chem-bio threat for three reasons. First, the normative influence and legal strictures of the CWC and BWC would reduce the variety, quantity, and dispersal of chem-bio-usable agents within states, thereby diminishing terrorists’ chances of illicit access – and there would be no fully weaponized agents possibly to be accessed. Second, if there are states that do “harbor” terrorists, then those states may be less likely to do so if they believe such terrorists might pursue chemical or biological weapons, because castigation of and opposition to such a harboring state would be severe, if the terrorists actually conducted a significant attack with unanimously-banned chemical or biological weapons. Third, it is possible that even some terrorists may develop qualms about pursuing chem-bio weapons in a world wherein all states have formally abjured those instruments through joining the CWC and BWC (before signing the nuclear ban). The salient objection to required CWC/BWC accession before a state signs the nuclear ban hinges on the fact that today’s (mere) several or so states that presumably do maintain some level of active chemical and/or biological weapons programs would have to officially renounce chem-bio weapons before the current nuclear states renounce nuclear weapons (upon entry into force of a unanimously joined nuclear ban treaty). Would today’s chem-bio possessors do so? Extreme skeptics would argue No, they would not join the CWC and BWC, because if they did then for an indeterminate time they would no longer have their chemical and/or biological weapons while their nuclear-armed neighbors/rivals still have nukes – until entry into force and full enactment of a worldwide nuclear weapons ban. But, to the contrary, in all likelihood chem-bio possessors would join the CWC and BWC before signing the nuclear ban; and ironically, for the same reason they are widely understood to be chem-bio possessors – the threat or perceived threat posed by nuclear weapons of another state or states. With the actual introduction for states’ signatures of a nuclear ban treaty, the incentive of prospective freedom from the supreme threat – nuclear – would powerfully induce today’s CWC/BWC non-signatories to join the CWC and BWC, and then the nuclear ban. In addition, the states in question would, and predictably to them, be praised and likely reap some tangential but real benefits from joining the chem-bio bans. Worldwide prohibition of chem-bio weapons is important, and would be especially so to nuclear weapon possessors such as the USA (and Israel) in their contemplation of possible accession to a worldwide nuclear ban treaty. It is likely that some at least of the current nuclear states would not sign such a ban, and it would not enter into force, unless all states renounce chem-bio arsenals by joining the CWC and BWC; and therefore it is recommended that prior CWC/BWC accession by states be required before a state signs the nuclear ban. Today’s several or so states that are presumed possessors of chemical or biological weapons or both likely would join the CWC and BWC, whereby they would gain world praise plus probable concrete benefits and, more importantly, then those states could sign the nuclear ban and thereby not impede its progress to unanimous accession and entry into force – which would liberate today’s chem-bio possessors, and all states, from the supreme threat posed by existence of nuclear weapons.